Roof Trusses are a fantastic element of architecture and are often used as a reliable and aesthetically pleasing support for roofing systems. Wood truss installations are sometimes left exposed as feature trusses – after all they are so amazing to look upon. They also give some insight into the construction, design and indeed character of the building. This modernist, minimalistic church in Tarnow, Poland is in some ways more truss than church! The wood is left naked and bare, which helps when showing off the earthy, elegant nature of the material. The small wooden church was built high on the bank of the Vistula River in the small and quaint village of Tarnow, it was built by a private investor. The church serves as a place of quiet contemplation and prayer for the local community and is constructed entirely from wood; this is permitting its single glass wall. This window is the background of the altar. Within here you can find peace and serenity by looking out through the window to the river and beyond, over to the horizon. At the heart of Lorraine National Park, the Sainte Genevieve chapel can be found through the hiking trails near the riverside of Meuse. A natural site at which the forest remains as the main aesthetic feature. This is aside from this magnificently overlaid truss which supports the roof of this small but handsome building. 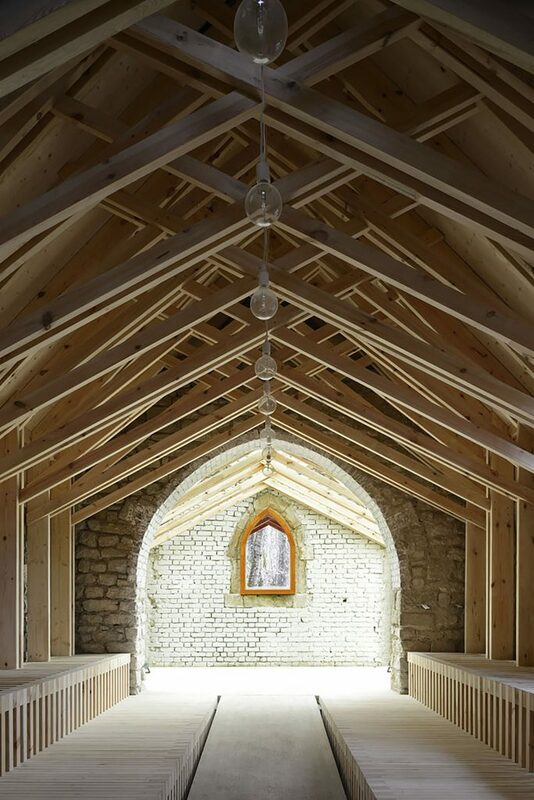 After fire damage the chapel was compromised in its integrity therefore the truss renovations took place in order to support it with a new dense, repetitive wooden frame. The result is a beautiful pattern. Today the chapel is used for prayer, activities or a shelter for weary hikers. Following the main sanctuary of the 130 year old roof system of a classic New England church, Father Perkins wisely contacted some engineers and architects to help out. It was decided to take down the old walls and roof to the foundations and rebuild from there. Using Douglas fir timber, the team constructed some graceful arched beams which would serve as the new support for the roofing system. This is a classic ‘hammer beam roof’. The result is a gigantic, elegant church building. This historic Roman Catholic parish in Charlestown, Massachusetts is the result of a merger of two separate parishes. The building itself is one of the masterpieces of architect Patrick Keely who built it between 1887 and 1893. Its ornate interior boasts stained glass windows and a hammer beam oak ceiling. This includes some intricate angels that were carved by Keely himself. 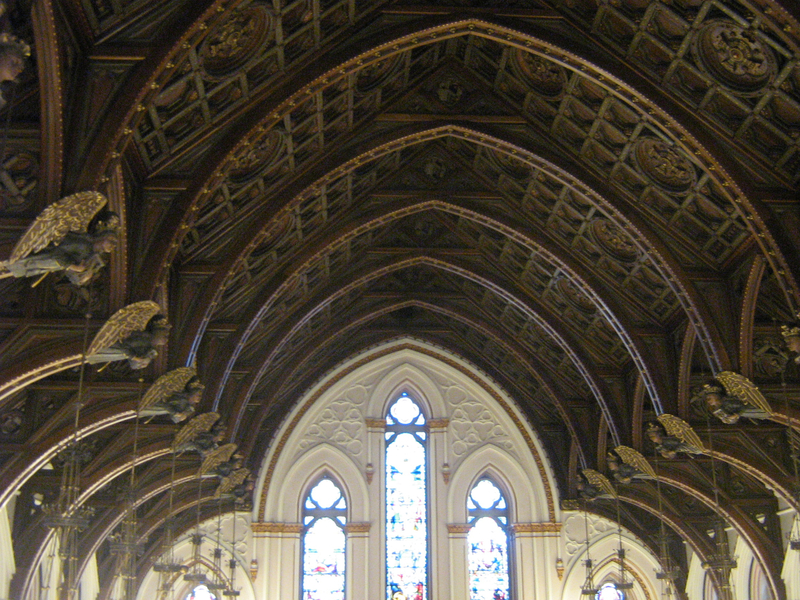 This is really something to behold as these trusses feature stunning attention to detail and intricate designs and patterns worked into it. The St Catherine’s building is a Romanesque design which was completed in 1895, closed in 2008. The brick building is a well-known landmark visible from the Tobin Bridge. This entry was posted in Building, Inspirational Ideas by homeadmin. Bookmark the permalink.